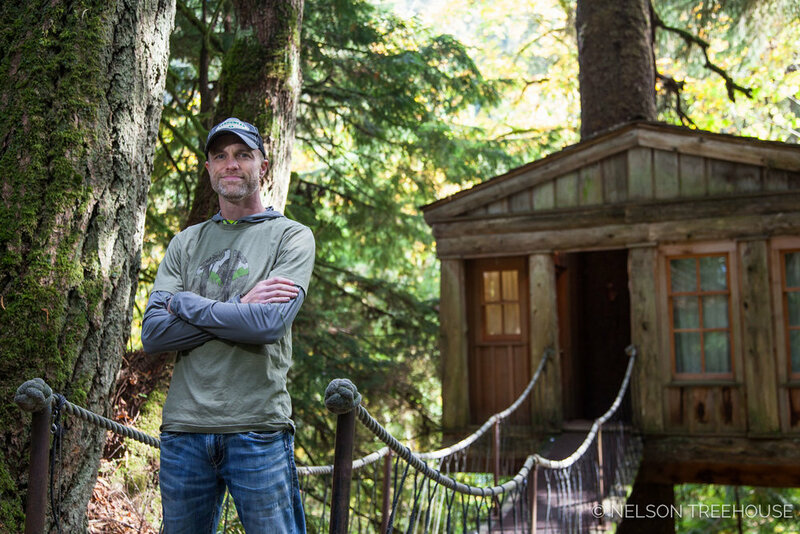 How do we transform Pete Nelson’s designs into real-life treehouses? Two words: project managers. Meet Scott Atkins, one of our mythic project managers. Scott’s long career in construction literally ascended from the concrete industry up to the trees. 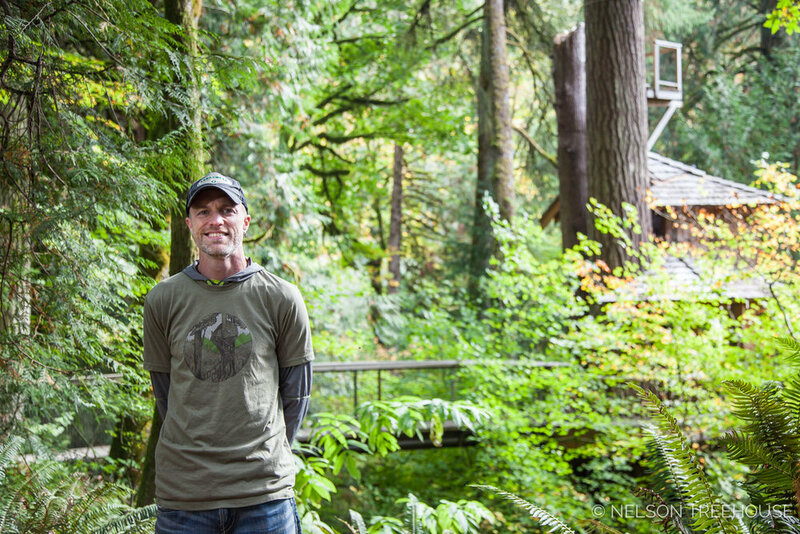 This background serves as a fitting metaphor for Scott’s impact at Nelson Treehouse: he grounds our work with rigorous research and attention to detail. In so doing, he makes treehouse-building—an (in)famously scrappy and spontaneous livelihood— into something vastly more consistent, professional, and, well, concrete. If a pole barn with an open floor plan could have secluded corners, Scott Atkins would be working from one of them. I know this because that’s exactly what Scott created for himself: when I first interned at our airy HQ in 2015, Scott’s desk was the only one sheltered by a propped-up portion of prefabbed treehouse wall. Scott’s makeshift private office was eventually framed in and paneled with beetle-kill pine. It is from this blue-stained wood fortress that Scott transforms many of Pete’s drawings into engineered, permitted, and buildable treehouses. On the daily, Seattle Public Radio emanates from Scott’s lair, a (singular) giveaway that he is in the building. It also conveys his passion for music (he’s a drummer in a band) and signals that his sheltered quarters are not meant to inhibit interaction or connection with coworkers. Quite the opposite: the people initially drew Scott to the job. "The people here exhibited an overlap of knowledge, experience, creativity, and competency." Scott has a penchant for founding long-term relationships with the people he works with: his previous boss gave a speech at Scott’s wedding, and his former business partner is his childhood best friend. Another lifelong relationship of Scott’s? His connection to the construction industry. As the son of an engineer, Scott grew up around building. Scott’s first adult job was in the concrete industry, which he then worked in for 15 years. Scott cut his project management chops by running his own concrete business. After ten years of managing his own jobs, Scott was hungry for a career change and began working for a framer and homebuilder. Around 2013, Robyn, Scott’s wife, connected him with Pete—in a stroke of small-town serendipity, Robyn had been Henry and Charlie Nelson’s preschool teacher and a part-time nanny for all three Nelson kids. Scott met with Pete and Emily at TreeHouse Point and started working as a carpenter in the prefab shop shortly thereafter. Six months later, Scott moved into the project management role. When Scott speaks, I get the sense that he is deliberate about his words: that he says what he means and means what he says. I ask him to describe his work as a project manager. “This is an unusually fast-paced job.” Scott gives a characteristically thoughtful pause. "As a project manager, my job is to collect all the pieces and set the table, then hand it off to people in the field." Do you like the pace? How do you find trustworthy people? A recent project of Scott’s that required inventive engineering was the lotus-shaped steel substructure for Bilbioteque at Treehouse Utopia. The substructure consists of 36 distinct pieces, which coalesce around a single cypress to form an ultra-strong foundation for the 400-square-foot treehouse. Scott’s interest in the fine details also transfers to his work in understanding how building code applies to treehouses. Scott is our resident permitting specialist, having secured over 20 permits for treehouses in 11 states and 14 jurisdictions. 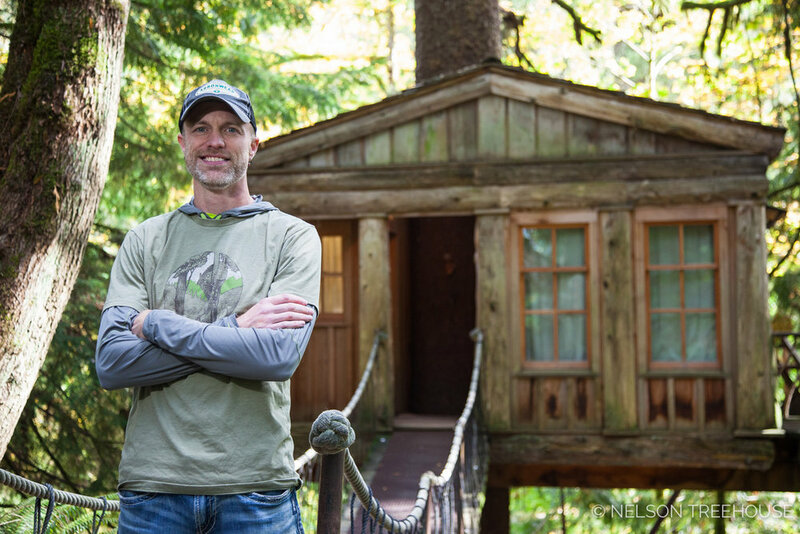 How did you go about understanding the way that building code applies to treehouses? What is it about building code that interests you? "The building code provides for innovation—its spirit and intent is to ensure safety and longevity, not to inhibit creativity." Many DIY-builders do see permitting as daunting, though. What advice would you give them? In 2015, Scott spearheaded our project to test the load-bearing capacity of our treehouse attachment bolts (TABs) at Washington State University (WSU). This test came at the request of a building department: load capacity figures were required to meet code standards for alternative hardware. Scott relished the collaboration with WSU engineers and the findings from the tests. 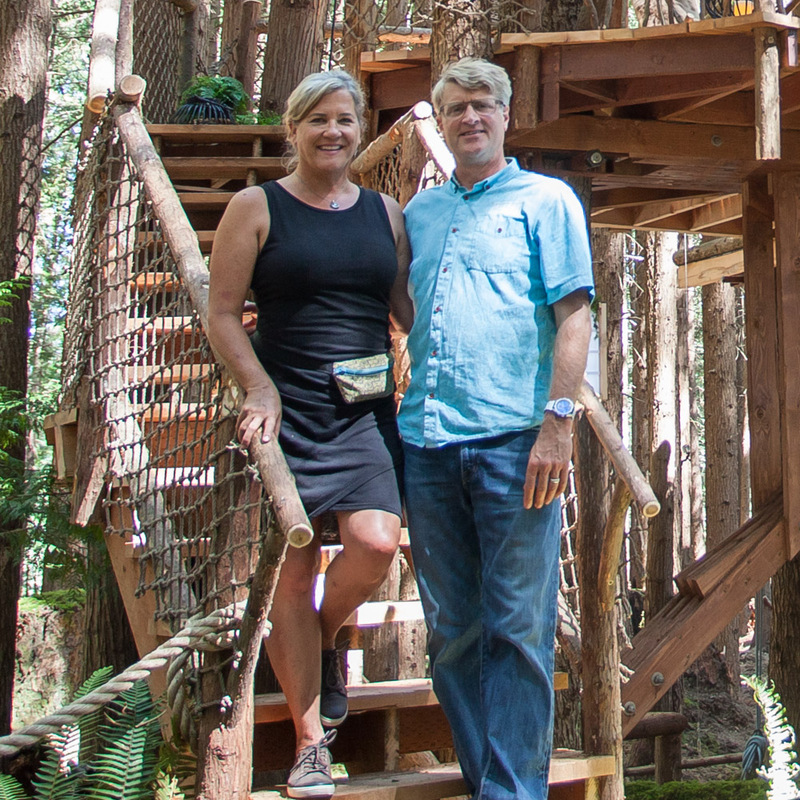 Recent treehouse projects that Scott has managed include the Semper Fi Treehouse in Pennsylvania, Hot Tub Rumpus Room in Washington State, and three of the treehouses at Treehouse Utopia (Biblioteque, Carousel, and Chapelle). I ask him which Nelson treehouses have been his all-time favorites. Some people say the Space Crab isn’t truly a treehouse, since it’s supported by posts. "I don't subscribe to the idea that using posts does not make a treehouse ... If you need a post to create the experience of being in the trees, then use it. The post should be celebrated." If you could build your own dream treehouse, what would it look like? What do you enjoy about playing music? With his many talents and passion projects, I wonder aloud what activities Scott has yet to try. “I want to fly.” Scott laughs. At the close of our interview, I ask Scott to share one piece of advice he would give his 20-year-old self. For this question, Scott doesn’t skip a beat. You can read all our Staff Spotlights on our intrepid crew here.